The film was the first attempt to revive Doctor Who, following its cancellation in 1989. 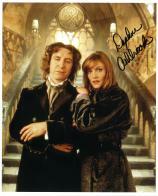 It was intended as a back door pilot for a new American-produced Doctor Who TV series, and introduced Paul McGann as the Eighth Doctor in his only television appearance. Despite a ratings success in the United Kingdom, the film did not fare well on American television, and no new series was purchased. The series was later relaunched on the BBC in 2005. Although the film was primarily produced by different hands from the 1963-89 series, and intended for an American audience, the producers chose to produce not a "reimagining" or "reboot" of the series (examples of such proposals can be found in Jean-Marc Lofficier's book The Nth Doctor (Virgin Publishing, 1997)), but rather a continuation of the original narrative. The production was filmed in Vancouver, British Columbia, to date the only episode of Doctor Who filmed in Canada.